We’re a Virginia state certified vehicle safety inspection station. Call ahead or stop in for fast & efficient service. You’ll be safely back on the road in no time. 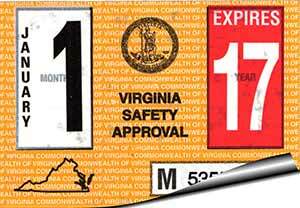 The state of Virginia requires safety inspections on all vehicles every 12 months. Your current inspection expires on the last day of the month indicated on the window decal. The inspection itself usually takes about 30 minutes at a cost of $16 for all vehicles including cars, SUV’s, trucks, trailers, and motor homes under 26,000 lbs.. Motorcycles are $12. We know that vehicle inspections are somewhat of a nuisance for vehicle owners but the process really is painless, and it’s a great way to stay on top of routine maintenance like wiper blade replacement, fluid level checks, and that fog light that went out last fall. If for some reason your vehicle does not pass the inspection we’ll thoroughly explain the problem and offer a detailed quote for resolving the issue. In most cases, when a vehicle does not pass inspection it’s due to a minor issue like a burnt light bulb or low fluid levels, either way we have the parts on hand to make the inspection go smoothly and without delay. The safety inspection procedure includes everything from headlights and tail lights to exhaust systems and brake components. For a detailed list of the required procedures and further information visit the Virginia State Police Safety Division website. Drive-ups are welcome but you may want to call ahead to avoid delays.